Blockout Roller Blinds – ideal for bedrooms and home cinemas these fabrics block out light and reduce heat, blockout fabrics give you privacy and protect furniture and flooring from sun effects like fading and bleaching. 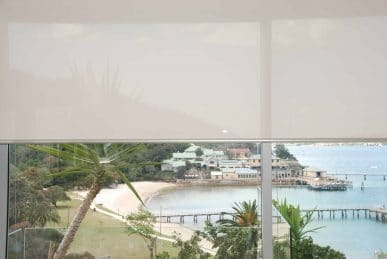 Translucent Roller Blinds – Ideal for living areas these fabrics reduce light, reduce heat, offer privacy and protect furniture and flooring from sun effects like fading and bleaching. These fabrics are ideal when both privacy and light are wanted but no view is required. Transparent / Sheer Roller Blinds – Ideal for living areas these fabrics reduce light, reduce heat, offer protection for furniture and flooring from sun effects like fading and bleaching. 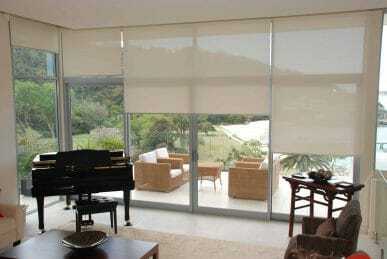 These fabrics are ideal when light is required, these fabrics also offer limited view through. Screen / Sheer Roller Blinds – Ideal for living areas these fabrics reduce light, offer heat reduction and glare control while maintaining the view. link or Coupling Systems – allow for two blinds to be controlled by one drive system (Chain Clutch or Tubular Motor or Aero spring). Double Blind Systems (Combo, Duel or day and night) – This option allows you to have two Roller blinds in one window, which is an advantage to those who do not wish to compromise between fabrics. For instance you can opt for a fabric to give complete privacy and block out the sun’s light and heat, and another to reduce heat and glare while retaining some natural light and view. Spring Assisted- On larger blinds the use of motors is advised as the pull force necessary to lift your blind by chain clutch alone can become a little difficult. However if it is not possible to run the necessary wiring for motorisation, then a spring booster can be retro fitted to your chain operated blinds thus reducing the pull force needed to lift larger blinds. Nomad Blinds works with some of the world largest manufacturers of motors including Somfy and Becker and Acmeda to create a motorised solution for your windows, sliding doors or projector screens. 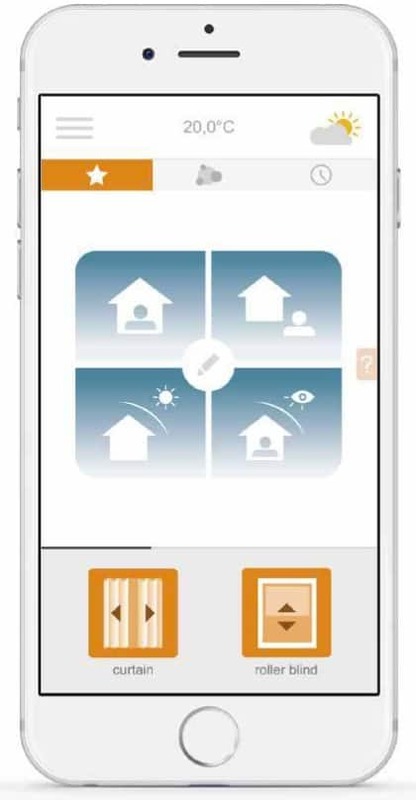 We can provide you with several options including remote control, wall mounted switches, timers, App controlled blinds and sun and wind sensor controlled systems. We are also able to link our motorised systems in with your home automation system (C-BUS etc). Battery and solar powered motors are a great option for those who can not run 240v wiring. The lates advancementis a range of App controled motors (blinds) including Acmeda ARC Automate pulse Featuring Bi-directional communication, Somfy Connexoon, Becker b-tronic smart central unit, and igloo options. Nomad Blinds works with the highest quality projector screen fabric to create sleek, motorised projection screens for use in your home cinema. We can fit your home cinema with a motorised projector screen and block out blinds for maximum light reduction which can all be controlled from a single remote. Our motorised systems are C-BUS compatible so you can control the blinds, the projector screen, surround sound, and DVD player from the one remote. Nomad Blinds can have your company logo or product image printed on a high quality roller blind (motorised or chain driven). Your image or logo can then be displayed in your shop front, meeting rooms; boardrooms or you can even provide them for display in your customer’s windows. This is a unique new form of advertising that is a great way to create brand awareness. We use very high quality printers to make sure that your images resist sun damage and with up to 5 years warranty on some of the fabrics we guarantee our product will satisfy your needs. Nomad offers the RB10, system 60 from Rollease Acmeda as an external roller blind or straight drop awning system the External system is extreamly cost effective in light duty aplications it can be wire guided and mainly motorised but also crank operation is available.